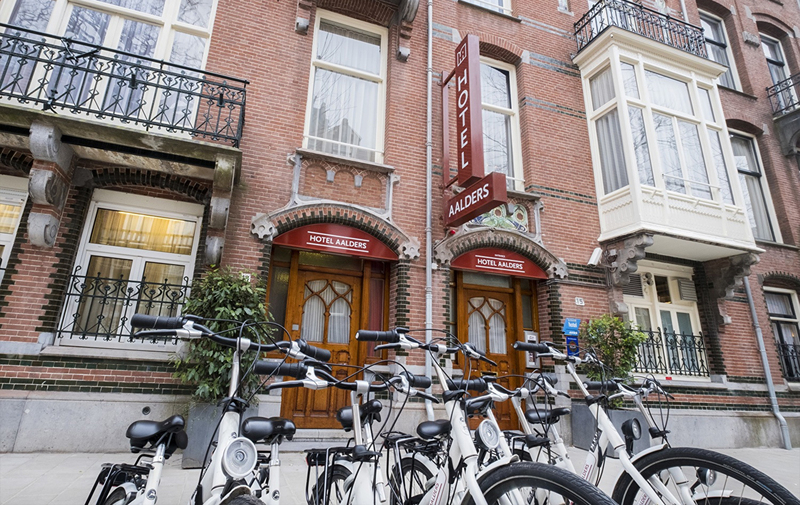 Hotel Aalders is located in the very popular Museum Quarter, the perfect starting point for visiting Amsterdam. Three famous museums are within walking distance of our hotel: the Rijksmuseum, the Van Gogh Museum and the Stedelijk Museum. If that is still not enough, pay a visit to our Koninklijk Concertgebouw and the Vondelpark, which are just a stone's throw away. If you prefer a shopping spree, do not forget to do some (window)shopping at the P.C. Hooftstraat. Here, you will find all famous designer brands. You can park in the street of the hotel. Most of the time there is enough space for parking, but it is paid parking. From Monday till Saturday between 09:00 and 24:00 you have to buy a parkingticket in the parkmachine in the street. Tarif is € 4,50 per hour. After midnight it is free. On Sunday the parking is free. Take exit S108 (Zuid / WTC / Amstelveen). At the traffic lights under the service road on the right (Zuid / Centrum), go under the overpass. At the third traffic light, after the Citroën garage and the Olympic Stadium, turn left. At the roundabout turn right into Cornelis Krusemanstraat At the end of the Lairessestraat, at the traffic lights (at the Concertgebouw) turn left into the Van Baerlestraat. The second street on your right is the Jan Luykenstraat. Hotel Aalders is 150 meters on the right. If you choose to travel by public transportation , we advise you to travel from Amsterdam Central Station with tram line 2 or 12 towards the stop Rijksmuseum . From there it is just a one minute walk to the Hotel Aalders. You can park in the street of the hotel. Most of the time there is enough space for parking, but it is paid parking. From Monday till Saturday between 09:00 and 24:00 you have to buy a parkingticket in the parkmachine in the street. Tarif is € 4,00 per hour. After midnight it is free. On Sunday you the parking is free. HOTELPARKING is a valet parking service for hotelguests and business people who need to park their car in the centre of Amsterdam for a long time. We pick up your car and drive it to a secure parking lot and also bring it back at the appointed time. First 24 hours € 35,- , next day € 30,- per 24 hous.